We’re back from visiting the family for Christmas and it there were no major family dramas. My two sisters who don’t get on all that well behaved themselves and the day just flew by. We all took heaps of pictures. Mum and us three girls all had cameras taking photos, some of which I share below. I don’t know if we consciously or sub-consciously took lots of photos of mum and dad because nearly a year ago dad had his stroke and he so easily may not have been around this christmas. 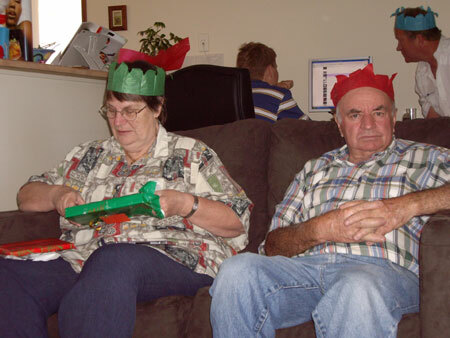 Mum also hasn’t been that fit this year so it’s made us all aware of our parents’ mortality. 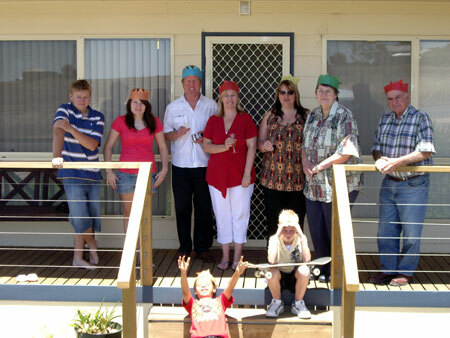 The rest of the family arrived around midday and we finally did the rest of the present opening. 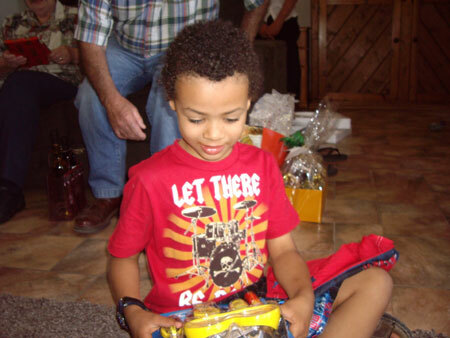 Here’s JJ opening his snorkel and goggle set which was on his list. He was more excited opening this, than his scooter. He also got a ukulele so we’ll be able to practise together now. We did an obligatory group shot. As I took this I’m not in it, but there are plenty around that might make their way onto the internet. As an aside, I used my sister’s digital SLR on Christmas day to take a few photos and I loved it. She’ll realise there’s a few photos that she didn’t take but I could so easily get used to using it. That will be on my wishlist for the next year or two. I ate too much and drank too much and after the others left we watched a dvd and I had a bit of a snooze. I’m back home now and I won’t be blogging too much because I’m on holidays and I also have to prepare for the conference. I am pleased with myself though – I got up just after JJ this morning to do an hour’s worth. I also did some yesterday so it will get done bit by bit. Procrastination is a powerful thing and I’m gradually learning that it’s best just to start doing stuff rather than think about how hard it is to do. Looks like you had a wonderful Christmas Jen. I’m pleased for you. I am glad that it was a fairly good Christmas! Good luck on the getting the presentation ready – when exactly is that all happening? I am excited for you. Sounds like a wonderful Christmas. We do crackers at our family celebration, too. we have pix of all of us wearing the tacky paper crowns, every year!